Well, it got pretty cold last night, there was frost on the grass so I am glad I took some stuff in. My image for today I shot in May and it fit well for the Bird Poker Game of Eating with a sub theme of Looking at Me. I had a number of Orioles visiting this year and they stayed for quite a while. Usually they would leave when the Mulberries came ripe as there were those to eat but this year they stayed through that and even some weeks beyond. 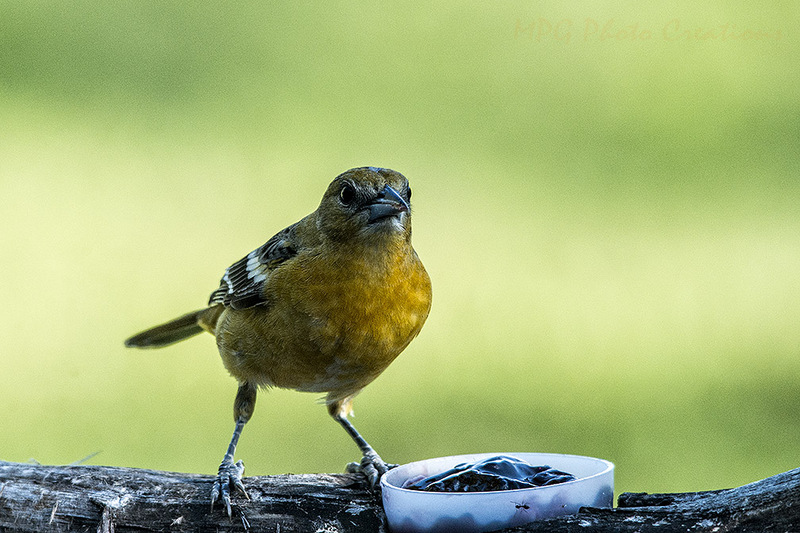 This is a female Baltimore Oriole and I was pleased to get the shot as she is usually very quick and elusive. I was able to capture her a couple of times.